Posting quality, targeted content on your brand’s social accounts is like casting a fishing net into a sea full of hungry fish waiting for the right worm to come along before they bite. But they won’t bite for just any old worm. Your social media management tactics should follow a well-crafted formula that will work to entice your potential audience into your wide cast fishing net that is the social media marketing funnel. Worthwhile sales are not born from attracting hotheads with a tonne of cash to throw out their windows. Worthwhile, meaningful sales are made through a process of building trust and credibility. The decision to spend money takes time and must be earned. This is where the marketing funnel comes in. The marketing funnel is not just a guide or checklist to be ticked off as you develop your social media management tactics. 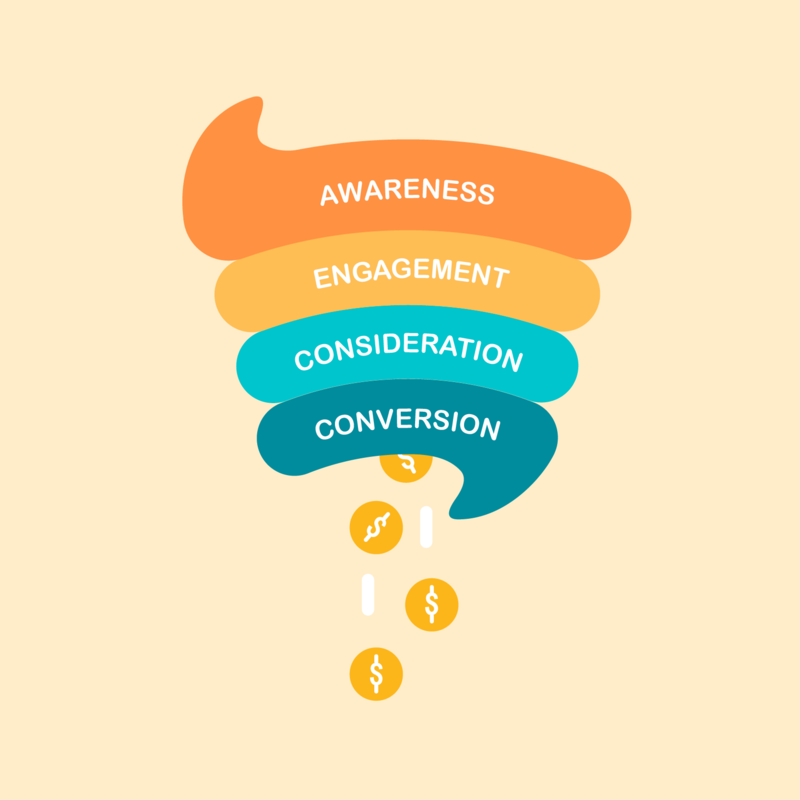 The marketing funnel is a linear evaluation of how your potential consumers’ relationship develops from the moment they become aware of your product, to the process of their engagement and consideration and then ultimately to the action they take in response. Whether these steps are achieved in a matter of hours, weeks or months it is imperative to understand your potential consumers and through social media management, foster your relationship with them every step of the way to successfully result in a sale. Social media provides the freedom to build your brands image exactly how you want. Informative, quirky, conversational or humorous, whatever you feel your target audience will relate to most you can be. Social media marketing companies build social media profiles campaigns around the knowledge that these posts are the voice of your brand, and the voice of your brand must speak to your potential buyers so that they engage with your brand. The initial stages of contact are crucial. You won’t be able to speak to your audience if they opt out of following your pages and staying in the loop of your product. Thanks to pixel, sponsored content and retargeting you have the opportunity to speak to those you may have missed on your first attempt. Now that you have their attention what is your next step? With the guidance of social media marketing companies, this is your opportunity to speak to your audience and say something that actually matters. Now that they know what you’re selling, their follows, likes or comments signifies that they are at the very least curious about what is on offer. So, what is so good about your brand? Should they trust your product enough to separate with their hard earned cash? Tweak your social media management so that your content provides value to your consumers, and demonstrates why your product is worth their time. User-generated content is an excellent tool to develop brand credibility as it shows real people enjoying your product. Increase engagement by creating incentives like prizes to encourage customers to post themselves enjoying your product. Potential customers who reach the ‘consideration’ step need to be carefully fostered. A sale hasn’t been won just because someone is on your website or liking all your posts. Scenario: I’m a 19-year-old uni student with a casual job. I’m looking for new clothes that are on trend, affordable and available quickly. I am torn between two different websites with my cart full in both, but I can only afford one and don’t want to double up on shipping. The first store offers a 15% uni discount, $5 shipping and two-week returns, while the other has 20% off storewide, $5 shipping and store credit for change of mind. While the second store is cheaper, I am more likely to purchase from the store that offers refunds as I can be confident that I won’t lose money by purchasing clothes I will ultimately need to try on before committing. As a brand, you must continuously present value to potential customers to convert them to sales and then continue to nurture that relationship once their card has been swiped to foster your new relationship and build loyalty. Through social media you can advertise promotions and exclusive sales through posts, stories, snap stories or elusive Facebook Ads. Adding a time limit from the time they see the promotion code until expiry adds to the excitement of finding a discount code and actually using it. The final step. Hopefully, the action is a customer conversion and you have successfully made a sale. Monitor the behaviour around both abandon checkouts and those who make a purchase to understand the drive behind your customer. This knowledge will help you plan and market to future potential buyers. Need help mastering your social media marketing funnel or looking for a social media agency who can do it for you? Red Herring Digital is a social media marketing company in Melbourne who understands what drives consumers to buy your product and services. To ensure your brand’s social media management is always working for you, contact us today.